New Resource from K12 Handhelds, Inc. 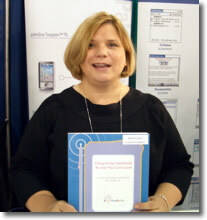 I found Amy Mann with K12 Handhelds at the PalmSource Booth at NECC 2005. I stuck my LifeDrive in her face and asked her to tell us about K12Handheld’s newest resource. Integrating Handhelds Across the Curriculum was written for students in grades 4-8. It comes with a book, posters, black-line masters, a CD-ROM, and an SD card. This resource has many lessons and everything is there for you to get started. Amy tells us about her favorite lesson, which is a Periodic Table scavenger hunt. Amy also explains that there are a lot of resources for teaching writing, including a Grammar Style Book to be read in Plucker. The lessons even include rubrics for assessment. Click here to listen to the four-minute recording.